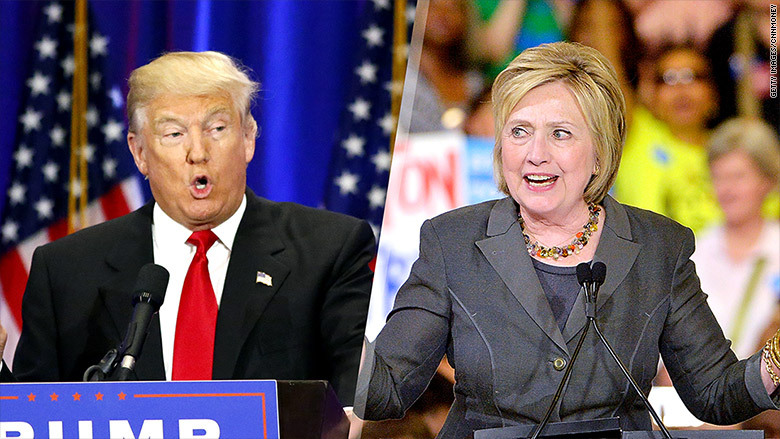 There are many stark differences between Hillary Clinton and Donald Trump. One of the starkest is how their proposals would affect the country's fiscal trajectory in terms of spending, taxes and debt. Both would increase debt. But a new analysis from the bipartisan Committee for a Responsible Federal Budget finds Trump's proposals would increase the debt "massively." The biggest reason: Trump has proposed one of the world's most costly tax plans. CRFB estimates it will reduce money going into federal coffers by $10.5 trillion in just the first decade. At the same time, he'd also increase government spending during that time by about $650 billion for, among other things, services for veterans and to enforce a tough immigration plan. Debt would rise by an estimated $11.5 trillion in the first decade. It would be 127% of the size of the economy, up from 86% projected if current laws remain in effect. The Trump campaign maintains his tax plan would generate enough economic growth to pay for itself. But even when CRFB makes allowances for potential growth, it concludes his tax plan would result in a steep loss of tax revenue. Clinton's proposals, by contrast, would increase debt by $250 billion, pushing it to 87% of GDP at the end of the decade, very close to where it would be absent any changes. Here's why: She proposes spending $1.4 trillion more than is currently projected -- for everything from college education to infrastructure to paid family leave and other initiatives. But Clinton has also proposed to pay for that new spending with $1.2 trillion in tax increases, primarily on high-income taxpayers and businesses. Neither Trump nor Clinton has proposed a plan to deal with the debt, nor have they talked much about spending on big entitlements, such as Medicare, which are key drivers of that burgeoning debt. In the context of their proposals so far, CRFB estimates what it would take for the candidates to achieve so-called fiscal sustainability. The group defines that as either keeping debt at today's level (75% of GDP) or balancing the budget after 10 years. The task, however, would be hardest for Trump. He would need to either: a) cut spending by 27% to 37%; b) increase all tax rates by between 17.5 and 20.5 percentage points; c) accelerate real economic growth by 160% to 390%; or d) do some combination of these. Clinton would have it easier, but in a world where it's considered a big success if Congress doesn't shut the government down over budget disputes, that's a very relative term. CRFB estimates she would need to a) cut total spending by 6% to 15%; b) hike tax rates by 3.5 to 8.5 points, and not just on the rich; c) increase growth by 35% to 125%; or d) have a combination of spending cuts, tax hikes and higher growth.